A project of Czech-Inspired Music. 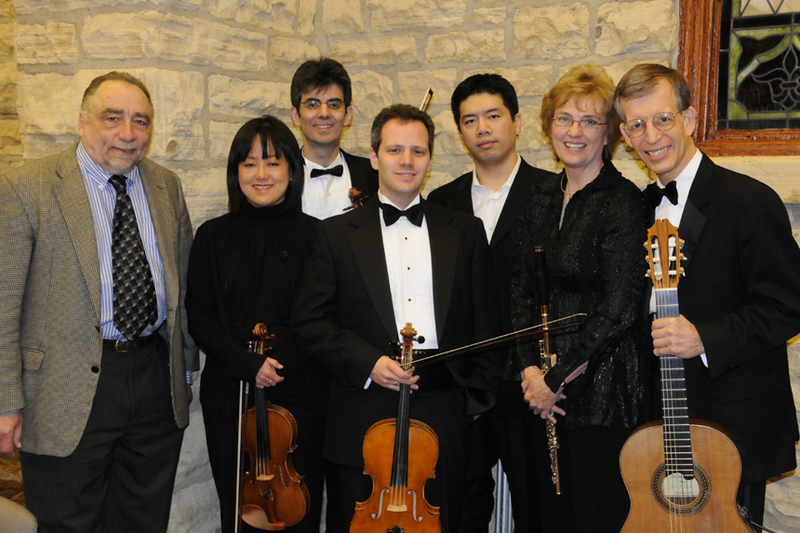 In January-April, 2010, a series of concerts celebrated Dvorak in Iowa. Conceived by Red Cedar Chamber music directors/artists Jan Boland and John Dowdall, the project reached traditional concert-goers, rural audiences, children in the classroom, workers in the workplace, and eventually even went to Caesar’s Palace in Vegas. Why do we call this project a Dvorak Sighting? Because Antonin Dvorak lived in Spillville, Iowa in the summer of 1893. It was here that he wrote his famous string quartet, now known as the American Quartet. Composer Harvey Sollberger used Dvorak’s string quartet as his inspiration when he wrote Spillville for flute, viola and guitar for Red Cedar Chamber Music. Each of Sollberger’s four movements are, in essence, a “variation” of Dvorak’s four movements. Between each movement, Sollberger arranged a short familiar (to the Czechs) Czech folk tune. 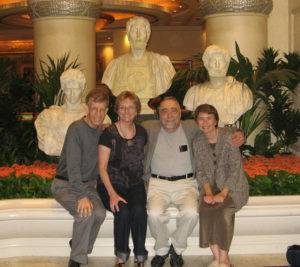 Composer Harvey Sollberger with Jan Boland, John Dowdall and members of the Avalon Quartet. Red Cedar Trio (Jan Boland, flute, David Miller, viola – also Michael Kimber, viola – and John Dowdall, guitar) premiered the work in 2006. Red Cedar brought the project back again in 2010 and paired Sollberger’s Spillville with a performance of Dvorak’s American String Quartet. Artists performing Spillville were Jan Boland (flute), Anthony Devroye (viola) and John Dowdall (guitar). The Avalon Quartet (Northern Illinois University) performed Dvorak’s String Quartet on the second half of the program. Members of the Avalon Quartet are Blaise Magniere (vln), Marie Wang (vln), Anthony Devroye (vla) and Cheng-Hou Lee (cello). The Spillville Trio was programmed again in 2012, substituting (with the permission of the composer) the cello for the viola. The final and fourth movement of the work, Hasty Retreat, can be heard in a live concert on YouTube. Concert sponsor was the Iowa Arts Council. Artist sponsors were Margaret Haupt and Max Naxera. 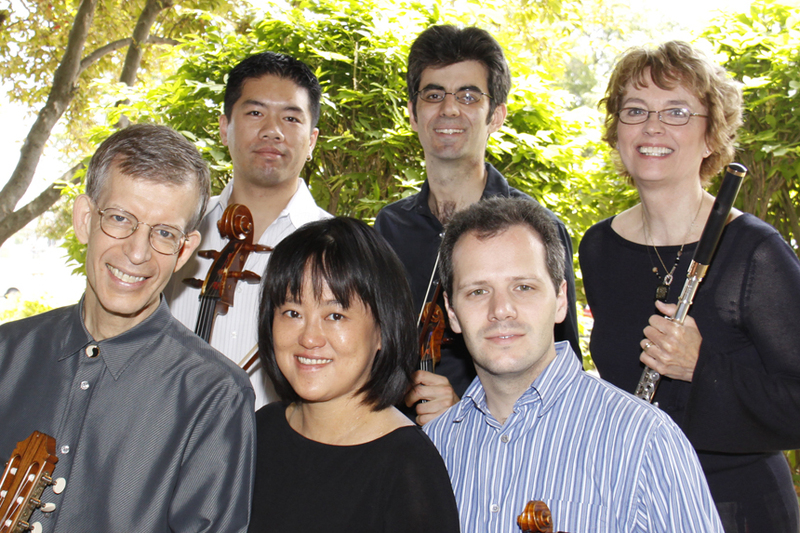 From left: John Dowdall (guitar), Cheng-Hou Lee (cello), Marie Wang (vln), Blaise Magniere (vln), Anthony Devroye (vla) and Jan Boland (flute). Spillville Trio was recorded in July, 2011 on a compact disc titled Spillville and Gilead: Chamber Music by Harvey Sollberger and released by Fleur-de-Son Classics in October, 2012. Recording artists are Tony Devroye (viola), Jan Boland (flute), and John Dowdall (guitar). The Sollberger “Gang-of-Five” helped to fund the compact disc recording – that “gang” included Chuck Peters, Joanne Chadima, Grinnell College, Laird & Patricia Addis and Clara “Peach” Moore. Harvey Sollberger’s Spillville Trio for flute, viola and guitar is published by the American Composer’s Alliance. 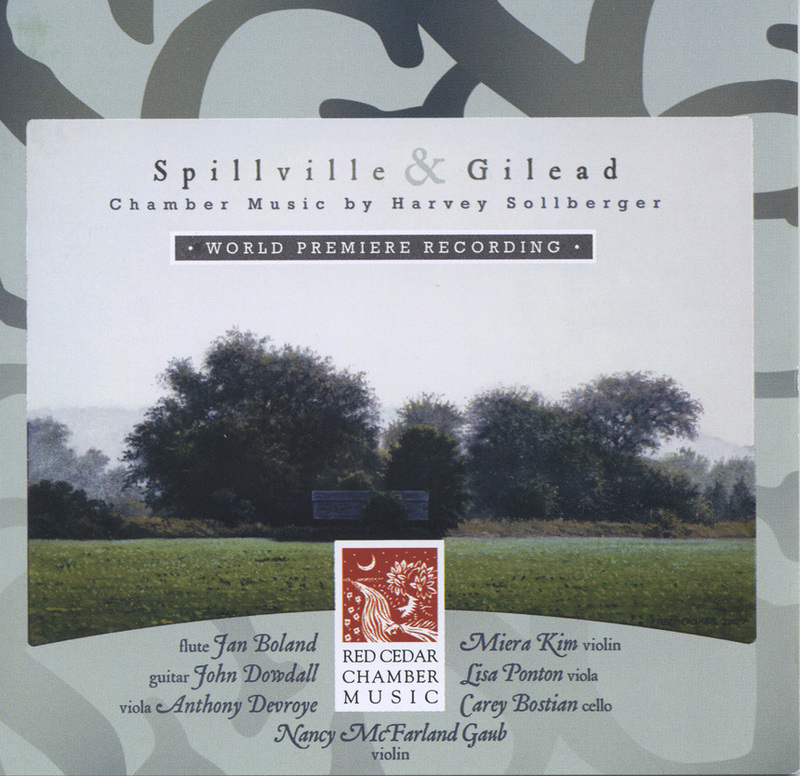 Harvey Sollberger’s Spillville (2006) is a trio for flute, viola and guitar inspired by Antonin Dvorak’s beloved String Quartet in F, Op. 96 – nicknamed the American Quartet. Dvorak wrote the quartet while living in Spillville, Iowa in the summer of 1893. Several residents of this tiny town kept diaries during his summer there. We know that Dvorak traveled by train from New York to Iowa, lived in a small second floor apartment with his wife and children, and rose early in the morning to take long walks along the Turkey River. He was struck by the sparsely populated, wide-open country and the songs of birds unknown to him – especially the melody of the scarlet tanager. He always carried a pencil, but when he forgot his notebook, he wrote musical ideas on his starched shirt cuffs or shirt collar – much to the dismay of the woman who did his laundry. These musical ideas, reflecting Iowa’s landscape and wildlife, coalesced to become the American Quartet, an iconic masterpiece that bears the distinct musical stamp of Dvorak’s first impressions of Iowa. Sollberger’s Spillville is a seven-movement work for flute, viola and guitar. Each of the four main movements is a reflection of the corresponding movement of Dvorak’s quartet. Between each movement is a little serenade – an arrangement of a Czech folk song – each scored for two instruments. Spillville is a fascinating reinterpretation of Dvorák’s musical language as refracted through Sollberger’s twenty-first century prism. • January 15 • Village Place, Marion, IA. • January 16 • Summit Pointe, Marion, IA..
• February 20 • Hiawatha Library, Hiawatha, IA. • March 25 • Family Concert at Lowe Park Arts & Environment Center, Marion, IA. • April 7 • United Church of Monticello, Monticello, IA. Tkt. • April 8 • Production Floor Performance. Marion City Hall, Marion, IA. • April 8 • Ainsworth Opera House, Ainsworth, IA. • April 9 • Meth-Wick, Cedar Rapids, IA. • April 9 • The Sondheim Center, Fairfield, IA. Tkt. • April 10 • Main Stage Concert. A Dvorak Sighting. First Presbyterian Church, Cedar Rapids, IA. In August, 2012 Red Cedar Chamber Music was invited to perform Sollberger’s Spillville at the national convention of the National Flute Association. Pictured above are John Dowdall (guitarist), Jan Boland (flutist), Harvey Sollberger (composer) and Lisa Ponton (violist). The concert was held in Las Vegas on August 9, 2012 on a program devoted to a retrospective of the music of composer Harvey Sollberger. 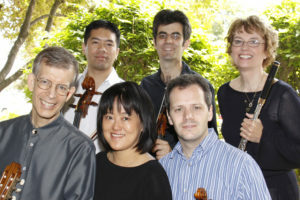 In 2003, Red Cedar Chamber Music asked Harvey to join a consortium of Iowa composers who each wrote a one-minute variation on the opening theme of Dvorak’s Scherzo movement of the American Quartet. The resulting work, consisting of a theme and 15 variations, is titled Spillville Variations on a Theme by Dvorak. That project met with great success. A series of educational events and outreach concerts over a 12 month period culminated in a 2004 U.S. premiere at the National Czech & Slovak Museum and Library in Cedar Rapids, Iowa, followed by performances in New York City under the auspices of the Czech Center of New York, at the Czech Embassy in Washington D.C., at the National Gallery in Prague, and at the Brno Conservatory of Music in Brno, The Czech Republic. The work was recorded on a compact disc on the Fleur de Son Classics label titled Czech-Inspired. Harvey’s contribution was a one-minute variation he called Dvorak and the Scarlet Tanager: his damn bird. At the conclusion of that project, Harvey was inspired to write a new trio for Red Cedar Chamber Music, which he titled simply Spillville. The variation became the third movement of this new work. “I just loved it! –As did the rest of the audience from 8 to 80+. I’ve lived in cities all over the country and have never had the chance to hear such lovely music in such an intimate setting.” J.S. “The music is beautiful beyond ordinary description. It swells the heart and goes directly to the soul.” G.D.
“Amazing musicians—Red Cedar and Avalon.” M.P. “Wonderful variety, superb musicianship, and a personal touch. Fabulous concert.” C.S.